A long time ago, Orphen was taught magic at the Tower of Fang. Things went well for a while and Orphen became one of the strongest magicians in the world, but his mentor (Azalie) became greedy with power and used a mystical sword to stab herself which transformed her into the dragon, Bloody August. The Tower of Fang decided that she must be eliminated which caused Orphen to leave on a mission to save her and to defeat the Tower of Fang if necessary. On his travels, he ended up meeting up with a kid named Majic and a rich lady named Cleao. Majic gets involved in the quest because Orphen decides to take him in as an apprentice (For a good amount of money of course) As for Cleao, her family owns the legendary sword that transformed Azalie in the first place so Orphen decides to take it back. Cleao follows him so that she can take the sword back once he’s done with it. The sword isn’t powerful enough to change Azalie back to her human form though so Orphen needs to find a few relics to amp up its power and allow him to cast the spell. Is it that easy though? A lot of complications occur and naturally the Tower of Fang aims to stand in his way. Along the way, Orphen softens up a little with the group, but for the majority of the series, he’s serious business through and through. He can’t relax until the mission is complete. Orphen’s plot is pretty engaging and this first series builds up a lot of the universe as we learn about the current status quo. The Tower of Fang seems to be the only ruling body in the world or at least the main one by which all others look to for advice. I wonder how they got such a high rank since the group doesn’t seem all that tough. If I could change one thing about the show’s plot, it would be that I’d like a better resolution at the end, fight-wise. There wasn’t really a big fight to end the series surprisingly and Orphen never got to have a big fight with Childman. Even fighting Azalie in her final form would have been a blast to see as the student surpassed the mentor. Unfortunately, all of these fights never got to happen which was a little disappointing. The series had a good amount of action in its run, but I feel like all anime should end off with a big fight. End on a high note right? Orphen’s the lead of course and he makes for a good one. He’s completely focused on the mission so he rarely humors his comrades on their comic relief subplots. He’s an excellent mage so he rarely ever loses a fight. He reminds me a little of Train Heartnet although he is typically in denial a little more. Azalie isn’t quite as selfless and nice as Saya was in Black Cat. It’s still a noble goal to save her of course, but he certainly bites off a lot more than he can chew here. Regardless, Orphen’s tough personality and ace combat skills make him a great lead. Cleao’s the main heroine and she always means well. Unfortunately, she’s not much of a fighter. She gets into arguments with Orphen quite a lot, which ultimately help him not get too focused on the mission to the point where he’ll lose everything else. When a fight starts, Cleao’s glad to try and help even if it’s only a little. It’d be great if she could learn a spell or two, but Cleao is certainly charasmatic so she’s got that going in her favor. The group needed an energetic character in the mix for the good banter and contrast that it brings. She owns Leki, a magical dog of immense power who comes in handy quite a bit. This also ended up helping Cleao a lot since Leki is immensely powerful and can blow away most opponents with ease. When Leki grows up, he could even end up being stronger than Orphen if the bigger versions of him are any indication. Then…we have Majic. Unfortunately, he’s a bad character. He’s one of the main comic relief characters of the series and a running gag is that his magical abilities are terrible and seem to never actually improve no matter how far the series ends up progressing. One scene towards the very beginning of the series doomed him though even if it was meant as a quick comic relief scene. Majic uses his spells to make a mirror next to where Cleao was bathing so he could watch. It’s a pretty despicable act and while Orphen put an end to it, it shows that Majic definitely has no standards. It’s a quick scene and Majic never does anything like it again, but there’s no way that he could be a likable character after that. When you’re in a small group on the road, you have to be able to trust your partners. After an act like that, there’s no way you can really trust Majic so it’s good to see him fail at performing spells for the rest of the series. Volkan and Dortin are the other comic relief characters. Volkan always acts as the voice of reason against Dortin while Dortin forces him to come along anyway. Dortin is like Hercule or other comic relief characters who always talk a great game before getting wrecked. It works really well for Dortin though and he is easily one of the best comic relief characters of this type out there. He gets most of the best lines in the entire show and the banter between him and Orphen helps to make the series so enjoyable. Typically, any scene with the two of them is going to be pretty good and a lot of Dortin’s schemes are fun even if they’re doomed to fail. I don’t really care for Volkan, but then again, I typically don’t care for the “straight man” in jokes or the serious comic relief character. It just doesn’t work for me at all and destroys the point of a comic relief character. The whole show is really about saving Azalie so she has a big role in this. For the first half of the series she’s essentially mindless. Not completely as seen when the dragon turns into Childman and he still has control, but it is hard to see what her plan is. Later on, we find out a lot of startling plot twists about her. The sword transformation may have not been how she planned it to go, but she was aiming for power for all the wrong reasons. She always wanted Childman, but as he was a reasonable mentor, he placed the friend zone card. That’s what Azalie wanted vengeance and she ultimately ends up taking over Childman’s body. From there, she freezes one of the Fang members, tries to destroy Childman, and also breaks the mind of one of the Elders. She is a complete villain through and through, there’s no way to get around that. Despite all of this, everyone treats her as a likable hero by the end who just went a little off course. You can make a plot like that work such as Cardfight Vanguard where Kai went around doing quite a few evil things before being taken down, but it has to be gradual. In Orphen, this turnaround is just about instant as soon as she is essentially defeated and Childman is turned back into a baby. Also, we learn that she essentially becomes the boss of the Tower of Fang in the sequel series. She never gets to pay for her crimes of murder and assault in the slightest. Don’t get me wrong, Azalie makes for a great villain, but it’s incredibly hard to buy the fact that she is now a “hero.” It’s not that easy and quick to switch sides and especially not when we see her being evil for quite so long. All it took was for Childman to remove the friendzone card from the table, but it’s way too late for that. So, while Azalie is cool, I think that the end plot development simply did not make any sense by the end. It could have been handled better. Childman is Azalie’s mentor and seems to be generally considered as the strongest magician in the world. His abilities are quite high and it is revealed at the end that he could even have defeated the Bloody August if he had wished to do so. I don’t like this guy though because he is supremely annoying. All along he wanted to save Azalie as well, but he just decided not to tell anyone and as a result, he made no real progress in his quest. Either way, he would need some artifacts if he wanted to do anything, but he never got any of them and then Azalie took his body with ease while Childman was in awe of her. He really could have handled the situation 100x better than he actually did. I respect his power, but that’s about all. Hartia is Orphen’s childhood friend, although you could barely tell from this season. Hartia acts like a friend and tries to act as a mediator between Childman and Orphen, but it’s tough since Orphen wants nothing to do with him. It also doesn’t help that while Azalie was in Childman’s body, she kept incriminating herself and Hartia intentionally to further widen the wedge between the friends. 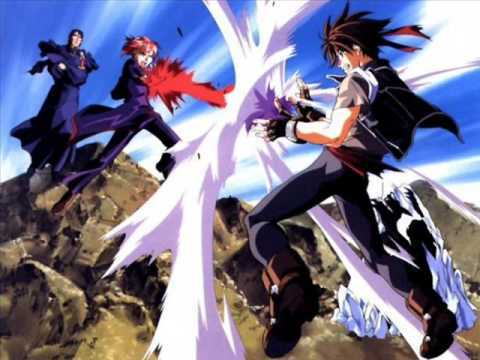 By the end, Orphen and Hartia had some all out battles with each other. Hartia could certainly have done a better job of explaining things at different points, but in the end the fact of the matter is that he chose the tower over Orphen and that’s probably at the heart of Orphen’s grudge. I like Hartia’s superhero identity even if it certainly doesn’t help to smooth things over with Orphen. He’s actually a lot stronger than he lets on. Flameheart is one of the main villains and he is the first opponent to flat out defeat Orphen before the fight was interrupted. He may not be the coolest villain around, but he is quite powerful. He meets with a bit of an anticlimactic end though as he made the same mistake as Azalie as he tried to grab the sword. I suppose that the sword is just hard to resist. I’m not really a fan of this guy though and he does do a lot of whining when things don’t go his way. Good villains have to keep their calm and activate a backup plan when things don’t go well. The show has some mild fanservice towards the beginning and the end. For the end it’s mainly through the astral projection of Azalie appearing for no real reason. It’s her astral form, but it is still overused quite a bit and Cleao also gets some towards the beginning, but by and large Orphen manages to dodge this trap for the most part. There are definitely a few filler esque episodes, but they’re typically not bad. At the very least, filler helps you appreciate the real episodes a whole lot more. Power Level wise, I’d place Orphen the character above several magicians like Dr. Strange and Lina Inverse (Definitely a close fight though and composite Lina could be another story with her Sword of Light) but physically he is around human level which can hurt him against fast opponents. As a series, Orphen is fairly realistic despite the magic so it wouldn’t rank too high next to other anime titles, but I’m sure that we’ll be getting some power ups as the franchise goes on. The soundtrack for the show is pretty good. We have a solid opera theme that plays for the big moments like when the Bloody August attacked the Tower of Fang. It was a great scene I have to add as it came out of nowhere and was pretty unexpected. Who would have thought that the big villain organization would be taken down so suddenly and in the span of around 2 minutes? These guys talked such a big game, but they crumbled in the end. There are quite a few other good battle themes in the series as well. Both of the openings are also quite good with the second one having better action scenes, but the first one probably encapsulating the themes of the show a little better. In the end, I will actually choose that one as my favorite for this series. As for the animation, it looks pretty solid. Especially when the high budget scenes show up, there is a noticeable difference. The colors are nice and vibrant and this is especially useful for the action scenes. Even when the budget is normal though, the show looks very clear. Naturally, the sequel series looks a lot richer with detail, but this one is definitely solid. There are even some illustration type shots towards the beginning of the series which are always fun. As long as they aren’t spammed of course, but that’s not the case here. 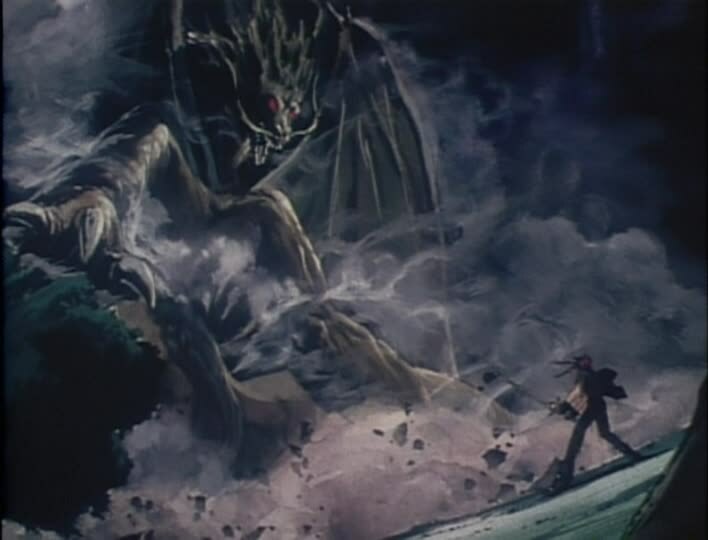 Overall, Sorcerous Stabber Orphen is a solid show. It’s definitely one of the more somber anime that I’ve seen in a while at times, but there is no shortage of comic relief characters, which keeps the atmosphere fairly light at well. The animation and soundtrack hold up very well and fight scenes are solid as well. It’s an all around solid show and one I’d recommend to all fantasy or action fans. If you like good banter a lot, but are not necessarily an action fan, I think you can still enjoy this show quite a bit as well. I’m just about done with the sequel series so you can expect a review for that as well fairly soon. It opts to drop the serious angle so it’s more of a lighthearted adventure which works well enough in its own right, but it is definitely different. 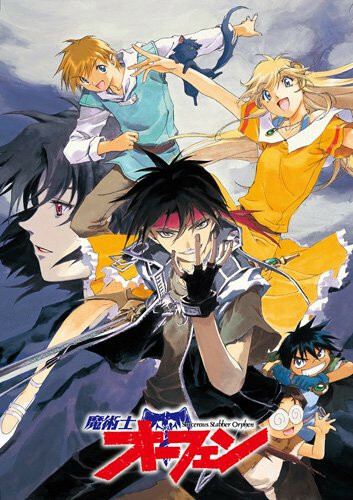 This entry was posted in 7 Star TV Shows, Reviews, TV Show Reviews, TV Shows and tagged Action, Anime, Anime Review, Azalie, Bloody August, Cleao, Dragons, Fantasy, Light Novels, Magic, Majic, Orphen, Review, Slayers, Sorcerous Stabber Orphen, TV Show Review by dreager1. Bookmark the permalink.